This wildlife adventure contains a spectacular package that will make your African holiday the best yet. Drive through Kruger's vast land while spotting the big five, have a thrilling night adventure in Balule seeking for nocturnal animals, and what better way to know the wild than by walking through the plains itself. You will not miss out on the lovely Blyde River Canyon and its breathtaking views. So, if you are looking for the best value safari, then Viva Safaris has it for you. During this safari, you will be staying at Tremisana Game Lodge and Marc's Treehouse Lodge. For the first night of your safari, you will get to enjoy your chalet accommodation at Tremisana Game Lodge. Tremisana is the largest and leading lodge in the Balule section of Kruger Park. It has a total of 15 chalets plus a two-bedrooms in the guest house. Every unit is thatched, air-conditioned, and en-suite with a shower, toilet, and basin. The rooms have a tea or coffee station. Insect-proof screens are fitted on all windows. Each bed has its own mosquito net. There is a splash pool, open-air boma for dinners around a crackling fire and a covered lapa overlooking a waterhole. A very beautiful luxuriant garden boasts numerous bougainvilleas, palms, and cycads which give the camp a subtropical tone. Water features add a soothing effect and the overall feel of Tremisana Lodge is very relaxing. At night, the subdued light along the illuminated paved walkways lend a romantic and magical feel to this outstanding camp. For nights two and three, you will be staying in tents at Marc's Treehouse Lodge. With seven tents, the lodge offers rustic but comfortable accommodation geared to put one in close contact with the sights, sounds, and scents of the wild. Amenities include electric fans, mosquito nets, comfortable beds, linen, towels, and soap. It has a swimming pool, a bush bar, and a boma where meals are served. You can relax around the crackling campfire and share your impressions of the day’s wildlife trip. At the lodge, you can inhale the fresh, balmy air of African bush veld. Fall asleep to the gurgling of the river, interrupted by the eerie whoops of hyena, spine-chilling wails of jackals, and the plaintive cry of the thick-tailed bushbaby. Awaken to the melodious chorus of birdsong and watch the activity of wildlife drinking at the river or at the spotlit waterhole. The team will collect you from your hotel or from O. R. Tambo International Airport (JNB) and you will travel via Dullstroom to Tremisana Safari Lodge in the big-five Balule Nature Reserve. You will then transfer to an open Land Cruiser for a sunset drive. The sunset drive affords your first opportunity of seeing Africa’s animals. The qualified guide will take you in an open 4x4 land cruiser game drive. After dark, spotlights are used to locate nocturnal animals. Stops will be made to photograph the stunning sunsets, listen to the night sounds, and admire the clear southern hemisphere constellation. Dinner will be a bush braai at the new marula tree boma. Viva Safaris has acquired a 20-hectare property deep in Balule, in fact over 10 kilometers from the main gate. They have built a beautiful boma under a magnificent marula tree which they have protected against elephants by a ring of sharp-edged rocks. It has a flush toilet and wash hand basin. Armed rangers will patrol while you enjoy a bush braai in a remote piece of Africa. After that, you can relax in your chalet and have a good night's rest. Awaken at sunrise for an exhilarating day of unforgettable bush life. You will drive to a remote part of the Balule Nature Reserve where you will enjoy a four-hour bush walk. Your experienced field guide will lead you through. The thrill of following Africa’s large animals until you can take a photo will remain with you forever. Adrenaline surges will be acute, notwithstanding the presence of your armed ranger. Return to Tremisana for brunch. Bush walks are very popular insofar as guests are afforded a brilliant opportunity to get really close to nature on foot. Guests will be in the presence of the big five animals such as elephant, lion, rhino, and buffalo. Although there is no legal limit to the minimum age of participants, Viva Safaris is informed by the recommendations of FGASA or Field Guides Association of South Africa. FGASA recommends that the minimum age be 16. Tourists aged between 12 and 16 may be permitted to participate in the bush walks as long as their parents take full responsibility in ensuring their children strictly obey all instructions from the rangers. At around 3:00 p.m. you will go on an afternoon game drive. Later on, you will transfer to the camp at Marc's Treehouse Lodge where accommodation is in tents equipped with beds and bedding, soap and towels, electric light, and fan. Your dinner and overnight will be available at the camp. You will travel on the open-sided game viewer to the Orpen Gate of Kruger. The added elevation and absence of windows allow for excellent viewing and photographic opportunities. Your qualified guide will show you various animals, large and small, that frequent the outstanding wildlife paradise. 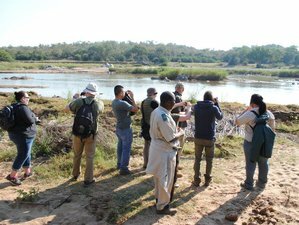 Safaris in Kruger Park are conducted on a nine-seater, open game viewing vehicle. They offer elevated vantage positions from where you are viewing and chances to capture amazing pictures are greatly enhanced. All the game viewing vehicles are 4x4 conversions with access to all roads in all weather conditions. The zone of Kruger that you will visit has the highest percentage population of giraffe, zebra, wildebeest, and impala that attract numerous lions and other predators. Have a hearty evening meal and retreat back to the camp to enjoy your overnight stay. Indulge in the fun experience of an early morning bush walk accompanied by an armed ranger. You will be shown various, interesting details of the bush, including insects, spoor, and scats. You have an excellent chance of encountering the buffalo, nyala, and other game on foot. After breakfast, you will drive to the Three Rondawels of the Blyde River Canyon. You will then return you to your hotel or airport at around 5:00 p.m.
On day four of your safari, you will drive to Blyde River Canyon to enjoy the unparalleled views of Three Rondavels. This safari will take place in Balule Nature Reserve and Kruger National Park. During this safari, your daily breakfast and dinner will be provided for you by Viva Safaris. On your first safari night, the team will hold a bush braai dinner for you. The bush braai is a welcoming and out of the ordinary dining experience. It is held on the first night of the safari. You will have dinner on a beautiful boma under a magnificent marula tree. Armed rangers will patrol while you enjoy a bush braii in that secluded place in Africa.